Why wait ’til 2 AM to get your groove on?? The good people at Thrive, Engage! Cleveland, and SCENE Magazine are inviting to put those work shoes to work at noon! LUNCH BEAT is a 1-hour healthy daytime club movement, founded in Stockholm, Sweden. It has spread to dozens of cities around the world with thousands of participants. Lunch Beat sessions feature a live DJ set with healthy snacks and water. 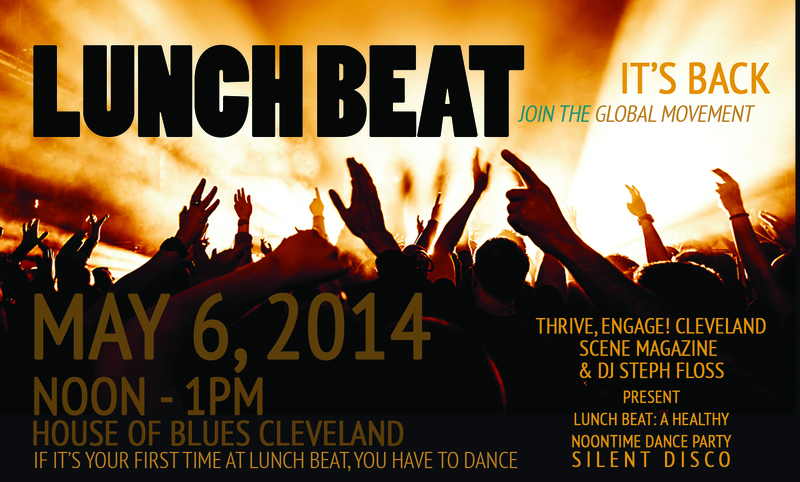 On May 6, Lunch Beat goes GLOBAL, with dozens of cities around the world hosting Lunch Beat dance parties as one. SILENT DISCO is a unique way of experiencing live music. Guests wear wireless headphones and a silent atmosphere instantly transforms into a connected, high energy musical performance. DJ Steph Floss will be on stage, transmitting his music into each headphone while the lights are dim and mystical. The difference: When you take your headphones off, you see high energy without the beat. ← Happy Dyngus Day Cleveland! !